We are close to a historic turning point at the continental level. I am astonished at the stupor of a political left that now exists only to challenge others and believes that Milan should not host the president of a European country, as if the left has the authority to decide who has the right to speak and who does not — and then they wonder why no one votes for them anymore.” — Italian Interior Minister Matteo Salvini. “This is the first of a long series of meetings to change destinies, not only of Italy and of Hungary, but of the whole European continent.” — Italian Interior Minister Matteo Salvini. “We need a new European Commission that is committed to the defense of Europe’s borders. We need a Commission after the European elections that does not punish those countries — like Hungary — that protect their borders.” — Hungarian Prime Minister Viktor Orbán. Hungarian Prime Minister Viktor Orbán and Italian Interior Minister Matteo Salvini have pledged to create an “anti-immigration axis” aimed at countering the pro-migration policies of the European Union. 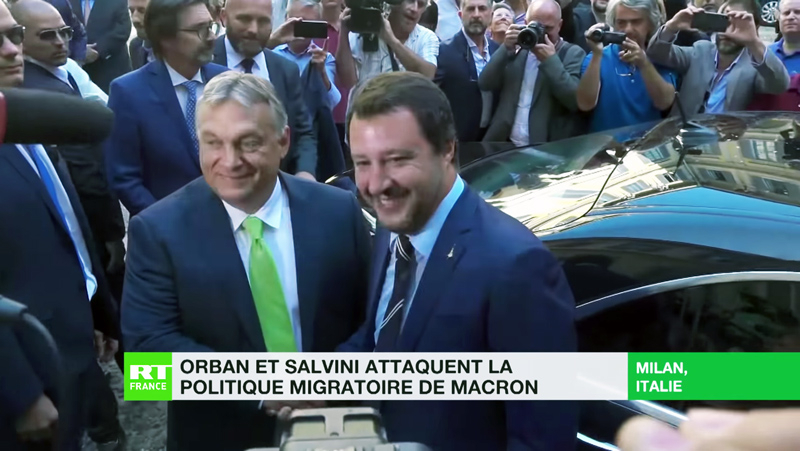 Meeting in Milan on August 28, Orbán and Salvini, vowed to work together with Austria and the Visegrad Group — the Czech Republic, Hungary, Poland and Slovakia — to oppose a pro-migration group of EU countries led by French President Emmanuel Macron. Orbán and Salvini are seeking a coordinated strategy ahead of the March 2019 European Parliament elections to defeat the pro-immigration Party of European Socialists (PES), a pan-European party representing national-level socialist parties from all EU member states. The objective is to change the political composition of European institutions, including the European Parliament and the European Commission, to reverse the EU’s open-door migration policies. Hungarian philanthropist George] Soros and represented by Macron, deny. “European elections will be held soon, and many things must change. At the moment there are two sides in Europe: One is led by Macron, who supports mass migration. The other side is led by countries that want to protect their borders. Hungary and Italy belong to the latter. “From the beginning of 2017 to the present day, the France of ‘do-good Macron’ has rejected more than 48,000 immigrants at the Italian border, including women and children. Is this the ‘welcoming and supportive’ Europe that Macron and the do-gooders are talking about? “Instead of giving lessons to others, I would invite the hypocritical French president to reopen his borders and welcome the thousands of refugees he promised to take in. Salvini has repeatedly criticized the European Union over mass migration, accusing the bloc of having abandoned Italy as it struggles to deal with the more than 600,000 migrants who have arrived in the country since 2014. The problem has been exacerbated by EU regulations. Under an EU rule — known as the Dublin Regulation — migrants must seek asylum in the country where they first enter the European Union. This has placed an inordinate burden on Italy, given its geographical proximity to Africa. Italy has long sought to overhaul the Dublin Regulation, but other EU member states, most notably Hungary, have opposed changing the agreement. The dispute highlights the challenges of forming a united anti-immigration axis at the EU level: the interests of many EU member states are diametrically opposed. Although Italy and Hungary, for example, agree that mass migration should be completely stopped, they disagree on how to deal with the migrants who already are in the EU. While Italy wants the migrants redistributed to other EU countries, Hungary and the Visegrad states are adamantly opposed to accepting any migrants at all. “I insist that we will not take any illegal migrants from Italy or elsewhere. This is nothing against Italy, to which we are sympathetic; it is a crucial strategy. It is, in my view, a key signal, a symbol and a message to migrants and smugglers that it makes no sense to sail to Europe….